Little Golden Books | What is ML Reading? ML’s favorite Little Golden Book is the same as mine. 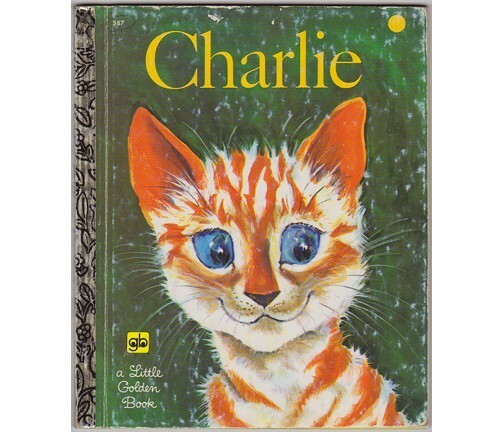 Charlie by Diane Fox Downs is about a starving little kitten in an alley. An older cat tells him about living in the country as a kitten. . . the fresh milk, climbing trees and playing tiger in the grass. Charlie decides to leave for the country. He doesn’t find the country but finds his own place for fresh milk, climbing tees and playing tiger in the grass. It’s a grassy courtyard surrounded by houses with young children. The spine was fragile when I first read the book to ML. After the fifth reading, the front cover fell off. No big deal. A rubber band is all we need. My mother’s handwriting was beautiful. It is on the title page — To: Kevin and Kerri From: Kevin January 5, 1976. My name was an afterthought. It was added in black felt pen. The party favor at my brother’s fifth birthday was a Little Golden Book for each friend. They were only 49 cents each back then. Why my name was added later will remain a mystery. My guess? Mom didn’t buy enough books. Kevin and I were forced to share. Do you have a favorite Little Golden Book? This entry was posted in Picture Book and tagged Charlie, Little Golden Books by mlreads. Bookmark the permalink. I’d be happy to do it. Glad someone else loves this book as much as I. My posting caused a little strife in my family. My brother wanted his book back. I told him I offered it when we were cleaning out the house after my mother passed away and he wasn’t interested in it. His response, “Yeah, but I didn’t have kids then.” I bought him a used copy of Amazon so he could read it to his kids too. Actually, it wasn’t strife. Just some fun arguing and reminiscing about a kitten he brought home from my grandparent’s farm. He named it Charlie after the book. Sadly, Charlie ran away.